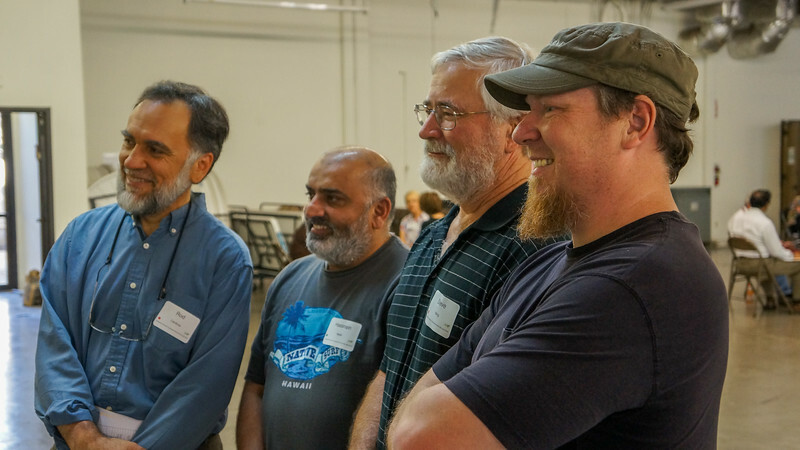 SAN JOSE, California — On Sunday, September 25, 2016, more than forty Jews, Christians and Muslims united at Masjid Al Mustafā, South Bay Islamic Association to prepare over 240 meals for the homeless and hungry. Volunteer orientation was led by Mr. Shan Saigal, VP of South Bay Islamic Association, Rev. Shelley Denney of Episcopal Church in Almaden, and Heather Rothenberg, Social Action Chair of Congregation Sinai. Volunteers then enjoyed getting acquainted in small buddy groups, before prayers were recited at the mosque. Thereafter, all prepared a kosher and halal meal in record time, then convoyed together to Cityteam Men's Recovery Center where the meal was served under the supervision of Chef Reynolds Stewart. Mr. Saigal recited a prayer in Arabic before residents of the shelter dined, then Rev. Denney thanked God in prayer before our friends who live outside dined. Guests not only enjoyed tasty lasagna, but also special Pakistani sweets (i.e., laddu and jelebi) served for dessert. Volunteers also enjoyed dinner together, then Rabbi Josh Berkenwald of Congregation Sinai offered a closing prayer. The conviviality experienced by all was palpable. Elianna Sigman of Congregation Sinai summed up the experience of many when she described the event as follows: "What incredible day! I joined with others at the Abrahamic Alliance International event. It's a group that gets people together from local synagogues, churches and mosques to build understanding between cultures and serve the community at large. We built multi-religious, cross-cultural connections through small group unity-building exercises and cooked/served dinner at a shelter downtown. I got to observe another religion in prayer, ask questions, share my own faith, beliefs and perspective, and serve the less fortunate in my community all in one afternoon. I made friends with people I never would have otherwise gotten the opportunity to meet, and connected with people on a pure human level through laughter, conversation, and service, both within the volunteer group and at the shelter. I both helped to create, and benefited from an environment of tolerance, acceptance and peace. I feel so incredibly uplifted and connected... and exhausted, lol! I can't wait for the next event!” Amen! Photos courtesy of Joel Colombero and Mike Schmidt. Image curator: Nathan Flohr.